Find out more about rivers with these fun river facts for kids. Learn about the world’s most well known rivers, famous events that take place on them, river based recreational activities, the world’s longest rivers and other interesting trivia and information. The longest river in the world is the Nile River, it reaches around 6650 kilometers in length (4132 miles). More Nile River facts. The second longest river in the world is the Amazon River, it reaches around 6400 kilometres in length (4000 miles). More Amazon River facts. The longest river in the USA is the Missouri River, stretching around 2,340 miles (3,770 km) in length (slightly longer than the Mississippi River). The two combine to form the longest river system in North America, reaching around 3902 miles in length (6275 km). More Mississippi River facts. Small rivers often have different names which include creek, stream and brook. The word upriver (or upstream) refers to the direction of the river’s water source, while downriver (or downstream) refers to the direction in which the water flows, i.e. towards the end of the river. 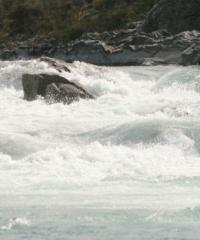 Rivers have many uses which include fishing, bathing, transport, rafting and swimming among others. Most of the world’s major cities are located near the banks of rivers. The Ganges, Yangtze and Indus rivers are three of the most polluted on Earth. The University Boat Race is held every year on the Thames River in London between the Oxford University Boat Club and the Cambridge University Boat Club. The crews feature eight members who battle it out on the 6,779 m (4 miles and 374 yards) course. The Colorado River travels through the south western United States and north western Mexico, it is home to the famous Hoover Dam. On January 15 2009, a US Airways plane successfully made an emergency landing in the Hudson River that runs through New York. After being hit by birds, the pilot of flight 1549 managed to land the plane in the river with the loss of no lives.